Introducing the New Ebook Edition! 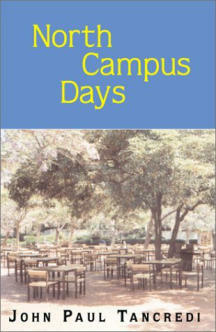 In celebration of the tenth anniversary of the print edition, North Campus Days is now available as an ebook! You can download and read the book in all of the popular ebook reading formats, including Kindle, Epub (Stanza Reader), LRF (Sony Reader), Palm Doc, as well as PDF, HTML, RTF, and Plain Text. New Edition . . . New Features! In addition to a preface by the author, the ebook features a handy "Cast of Characters" section to keep track of the comings and goings of your favorite characters during the story . . . as well as an Epilogue discussing the intervening years since the story took place to get you up to date on what the characters are doing today! To purchase your ebook . . . Please visit Smashwords.com and download your copy now! For a limited time, you can purchase the ebook at the reduced price of $3.95 . . . a 20% savings! Simply enter the coupon code DM85V prior to completing your checkout on Smashwords.